Is your book in there? So, here’s what the porch looks like as of Monday morning! I’ve got a pickup all scheduled with the post office and these should start hitting mailboxes later this week. 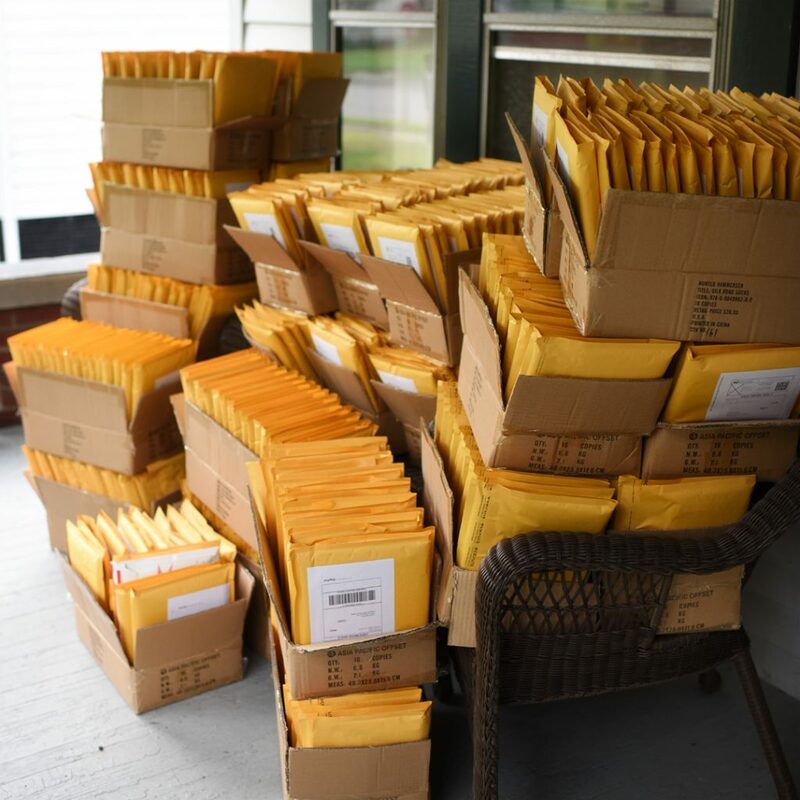 There’s one more batch to go out later this week to catch the orders that have come in over the last few days (that means don’t panic if you haven’t gotten a shipping notification yet…they’ll all be in the mail this week and all within a week of your order date as promised). We’re nearly there! Which makes this a really good time to remind you that the preorder ends this evening. At that point the price on the electronic version goes up, and I stop selling the paper version directly (you’ll be able to get it from your LYS and from amazon at some point, just not from me directly). ETA: Whoosh, the preorder is all done, so I’m swooping the buttons out so as not to cause any confusion…the e version is available on ravelry, and the paper version will be on amazon and at local yarn stores over the next several weeks! And if you prefer to get stuff through your LYS, that’s awesome! Tell them to get in touch and we’ll set something up. And if you prefer amazon, that’s cool too. Give it a few days and they should start offering it soon. And guys…next week I’m having a bit of a lie down for a day or two. Because wow! Mine came today! The book is beautiful and I think Ushak is going to be my first! Love the note cards.